With the federal election coming up this Fall, the Liberal government has released its proposed budget, and with it, Federal Home-Buyer Incentives. The federal government has proposed that it will provide assistance in two ways for first-time home buyers to manage the cost of a new mortgage. The first is easily explained. The feds would adjust the current Home-Buyers Plan (HBP) by increasing the borrowing limit from RRSPs. Currently, under the HBP you can borrow up to $25,000 from your RRSP in order to buy your first home. Under the new plan you would be allowed to borrow up to $35,000. The second incentive is better understood as a “shared equity mortgage”. This means that the Canada Mortgage and Housing Cooperation (CMHC) would give you a portion of the home’s purchase price as lump sum payment with the expectation that you pay it back, likely when you sell the house. You still have to provide the initial minimum 5% down payment on your own, but then the government would provide you with an additional 5% (for resale homes) or 10% (for new builds). What does this look like? Here’s the example provided in the proposed 2019 budget. In this example Anita provides her own 5% down payment and the government provides another 10%. This cuts her monthly mortgage costs down by $228. She can save this money, put it in her RRSP, use it for everyday living expenses, or throw it back at her mortgage to shorten her amortization period. The choice is hers. “The current qualifying criteria, including the stress test, allows a household to qualify for a house that is 4.5-4.7 times their household income,” James Laird, president of CanWise Financial, said. As for the CHMC incentive, the 2019 Liberal Budget states that their program will only be accessible to those who make less than $120,000 a year, and a participant’s insured mortgage and incentive amount cannot be more than 4 times his or her annual household income. For example, a household making $120,000 a year could qualify for a home that with a purchase price of about $564,000. But within the CMHC Incentive program this same household could only qualify for a home that costs $480,000. 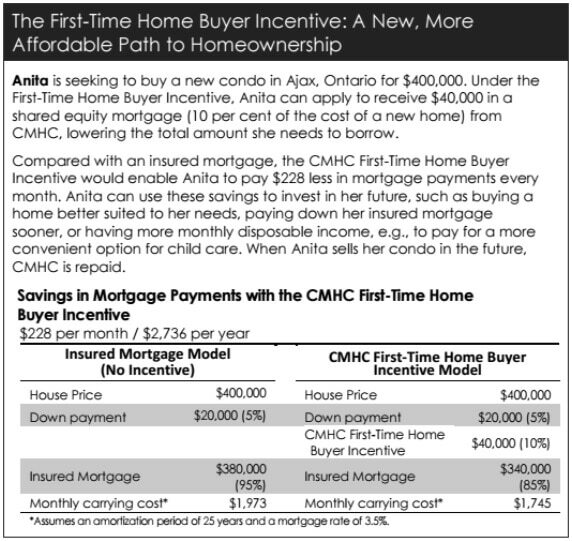 This means that by participating in the incentive program, potential first-time home buyers reduce the maximum purchase amount they qualify for by about 15%. The finer details will come to light over the coming months. Until then, try our quick mortgage pre-approval application below to find out how much you could qualify for contact us directly.